Carl and I recently spent a few days in São Paulo. It was a great trip! Seeing Carl use his credit card in Brazil, I realized that there is a script to making a payment in Brazil. There are keywords and phrases that will help you navigate the purchase process much easier. This is what this lesson is about. Your life will be much easier if your card has a chip on the front in addition to the stripe on the back. 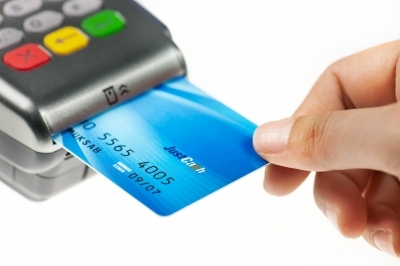 Your life will be easier in Brazil if your card has a chip. In Brazil we have not used the stripe on the back of our cards for a good while. Credit card machines will read the chip on the front of the card. You insert your own card in the machine as shown in the picture below. In Brazilian stores, you insert your credit card in the card reader. In the US, most cards are now coming with the chip. If your does not have it yet, I recommend calling your card company to ask for a card with a chip. If your card does not have a chip, the salesperson will slide your card, but not before showing great surprise. I find this very cool: In restaurants, they bring the card reader to you at the table. Your card never leaves your hands. It also makes it really easy to split the bill with friends. You just tell the server how much your part is. The server goes from person to person with the credit card machine. Very easy. In the end, he adds everything up to make sure your group has paid the bill in full. 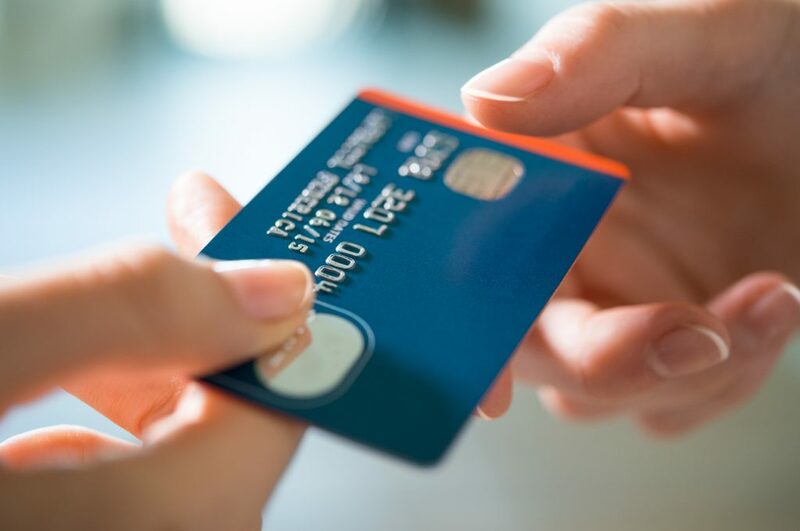 If you don’t, you may find yourself with a blocked credit card right after your first purchase abroad. It has happened to me. 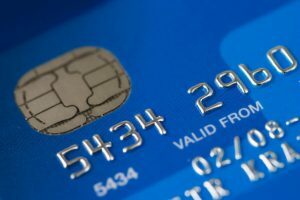 It is a safety measure by your card company. They see a purchase abroad, they may call you to ask about it or they may simply block your card. The best thing to do is to call them before you travel and let them know that you will be using your card abroad. Pode colocar o cartão. / Pode pôr o cartão. = You can put your card in. = Are you going to pay in installments? This is really interesting and very unique to the Brazilian culture. Pretty much anything that Brazilians buy using a credit card can be paid in installments without added interest. Say you are buying a TV that costs R$1800. You can choose to pay it in a lump sum or pay it in 10 installments (parcela, in Portuguese) of R$180. The number of instalments without interest vary from store to store. You can parcelar (pay in installments) even smaller purchases. For example, R$ 60 can be paid in 2 installments of R$30 or even 3 installments of $20. Unfortunately your foreign credit card will not allow you to pay in installments. This is an agreement between credit card companies and Brazilian stores. So when they ask you “Vai parcelar?”, you need to say: Não. Once the card processes and the receipt comes out, you will notice the salesperson’s surprise. In Brazil, we need to punch in our password before the transaction is approved. I don’t know about you, but I don’t have a password with my American cards. So when the transaction is approved without a password, the salesperson often feels surprised. Sometimes they look like they may have done something wrong. They keyword here is: senha = password. They will ask you to sign the receipt. We Brazilians do not need to sign it as our password makes the signature unnecessary. = You may remove your card. Often there are no returns here in Brazil. Exchange policies varies from 7 to 30 days. But it is a very unfriendly process. You go to customer service, they ask you questions and fill out a form. This takes a little time. Then you get a “vale-troca”, something like an exchange certificate. Attention here: Most of the times that certificate is valid only that same day. Additionally, the certificate often has your ID number on it, so only you can use it. Not very practical, is it? Practicing before your trip will make your life much easier in Brazil. You can get ready for different shopping scenarios, ordering at the restaurant, asking for directions, etc. 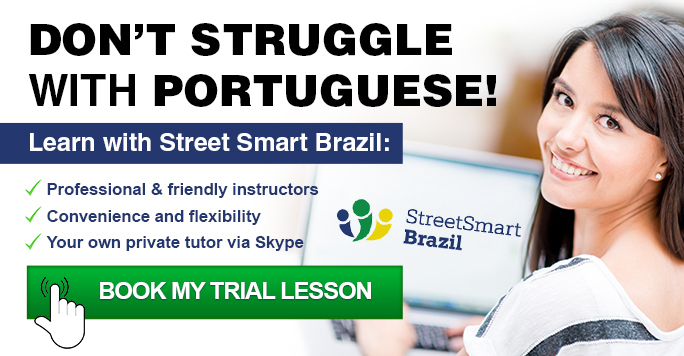 Street Smart Brazil offers one-on-one Brazilian Portuguese lessons through Skype. It is a simple, convenient, and effective way to learn Portuguese. Book a Trial Lesson to see how we can help you speak Portuguese comfortably. I hope you have fun sightseeing, eating, and shopping in Brazil. As I write this post, US$ 1 is worth over R$ 4. Your dollars, euros, or pounds will go a long way in Brazil while the exchange rate stays this high.